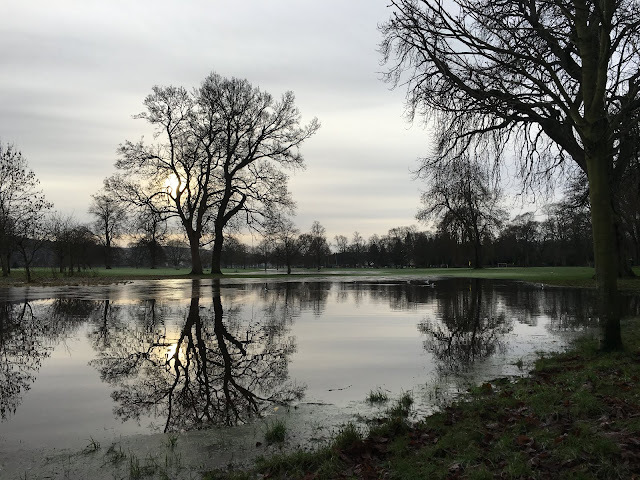 New Year's Day always brings with it the excitement of the once-per-year parkrun double, an opportunity to complete two official parkrun events on the same morning. 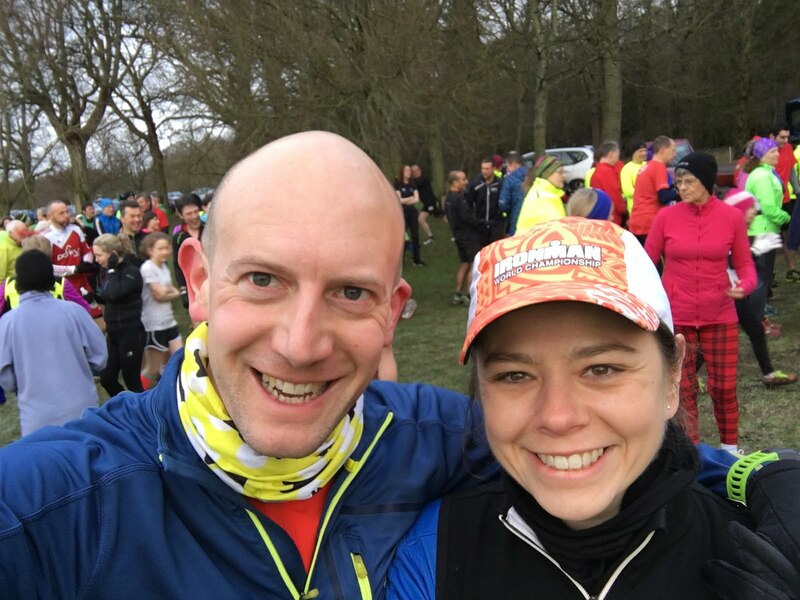 It's the only day of the year that the parkrun pixies will allow two times to be logged for a single athlete, and runs that are near each other have taken to pairing up and offering locals an early run, then a later run at a different course with ample time to drive, cycle, or sometimes jog between the two. There's even an official Christmas Compendium page to help you plan your festive fun. Once upon a time way back in 2012 we even did three in a day (Bushy, Nonsuch, and Riddlesdown), but that's a story for another day (and no longer permitted under the current rules - bah!). It's a special day for the parkrun tourist community as we get a chance to go to some far flung corner of the world and run a pair of runs that we wouldn't normally get to. Two years ago a group of us went up to Middlesborough to run Stewart and Albert parkruns. Last year we kept it local as Mrs had just had an ankle operation, so we took a short drive West and I ran Woodleigh and Reading parkruns while she patiently waited in the car (love is...). This year, as New Year's Day was a Friday, we get to play on Saturday too and so we decided to make a long trip somewhere to take in three local runs. Never having completed a run North of the border, I voted for Scotland, and so we booked a few nights at a hotel in St Andrews and headed off up North on the train. 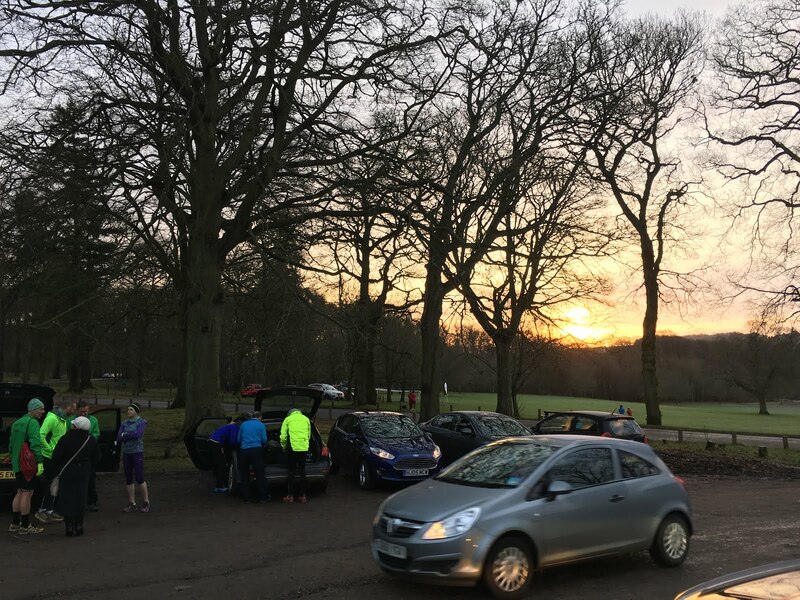 Camperdown (Dundee) and Perth parkruns were staging a double, with Camperdown starting at the traditional Scottish parkrun start time of 9:30 and Perth, a half hour drive away, starting at 11:00. 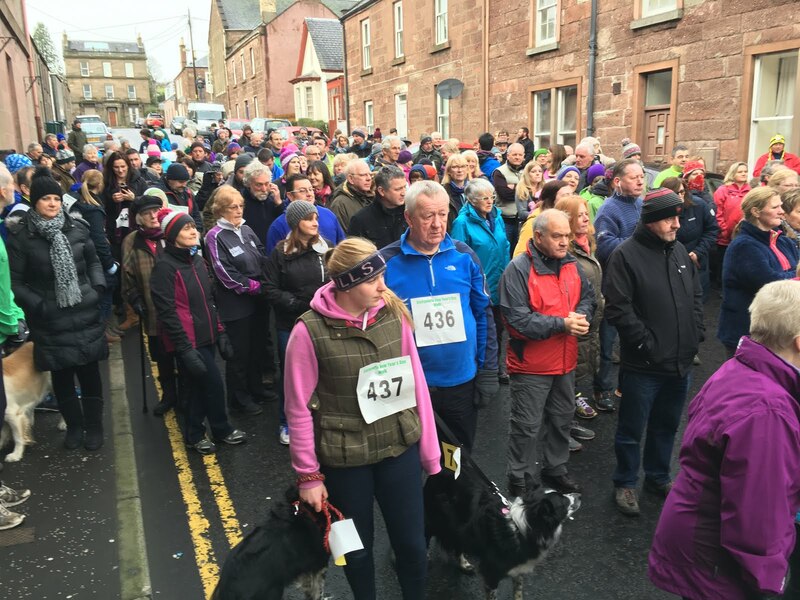 I noticed on the Perth parkrun page mention of another run in the area, the 30th annual Blairgowrie New Year's Day fun run - turn up on the morning, register, and for £2 enjoy a 6-ish kilometre run around the town. Sounds fun, and my training plan called for 18km, so count me in! (I can't include a link to the event page because it seems as soon as an event has happened, Discover Blairgowrie deletes it!). After seeing in the New Year to some seafront fireworks (and my first ever sight of the Northern Lights) and one or two (or three) cocktails, we tucked up early (ish) to get some sleep ahead of our New Year's Day trio of runs. First on the list was Camperdown. 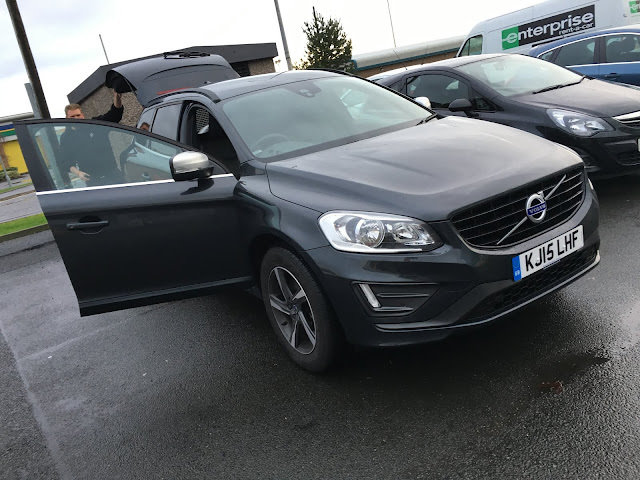 Mrs plumbed in the postcode to the hire car satnav, and we were off. There was hardly anyone else on the roads so our trip was uneventful. We arrived at about ten-past nine, and there was a constant flow of cars arriving behind us - lots of Perth running club tops, clearly doing the double was popular! 9:15 in a frosty car park in Dundee - this is how you celebrate New Year's Day! Camperdown was cold, the leaves and grass were very crispy under foot and made a satisfying crunching during my warmup jog. I had a quick chat with the event director who said they were very pleased with the turn out. We set off roughly on time. The course is a large loop on the side of a hill, quite muddy down the bottom, and with some good inclines to warm us up. I ran round with Mrs and finished in a respectable 29:57 with plenty in the tank for the next run. We joined the parkrun procession from Dundee to Perth (or at least, we joined the back and overtook most of it, thanks to my right foot), and arrived at a very slippery car park in a sports centre - home of Perth parkrun. I was concerned that the event may be cancelled, they had a lot of flooding in the area and their Boxing Day parkrun was cancelled as flood barriers were in operation in the park they use. 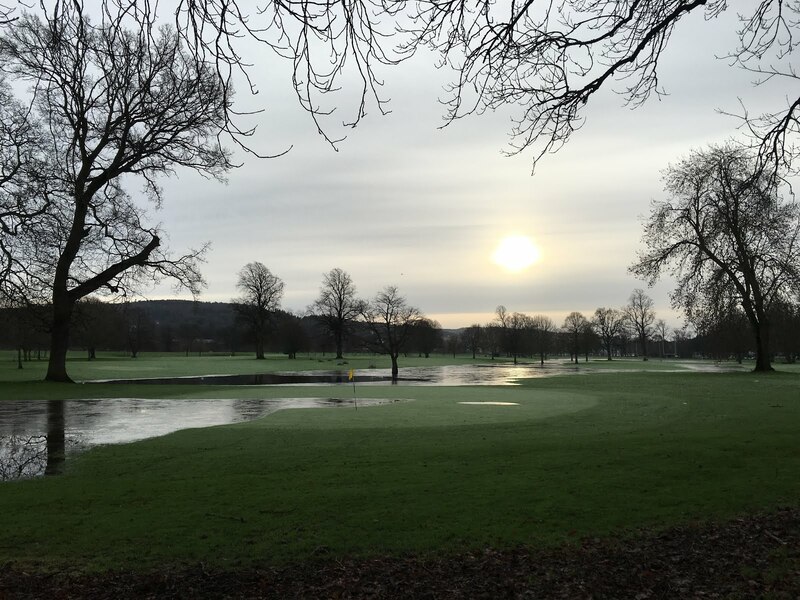 Their facebook page had been updated and showed quite some resolve to stage an event - they even designed a new course just for the day, designated the C course (as the A and B courses were still blocked by flood barriers). The parkrun double is clearly a serious business up here! The C course was two laps of an out and back style course, with the start/finish line half way along. I call these "promenade" courses - in fact the course layout was exactly the same as Hove Promenade parkrun. 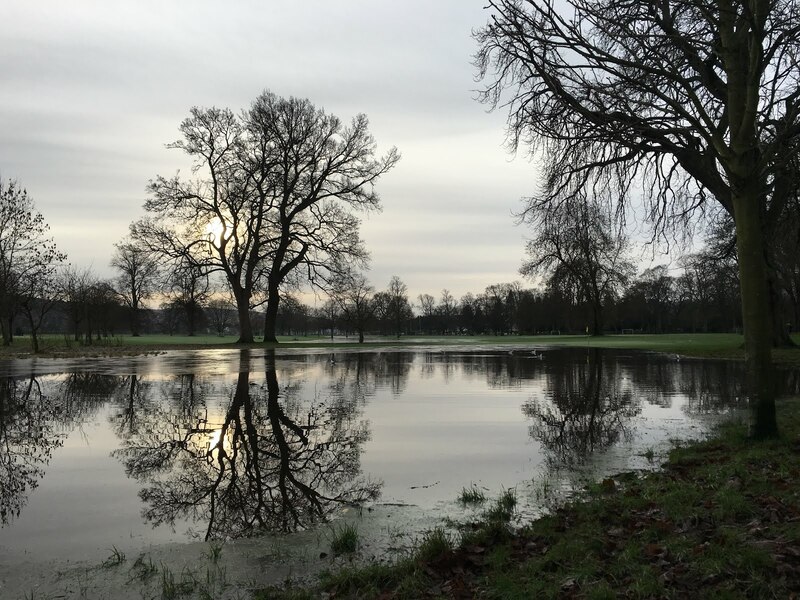 It was clear why they had to go to unusual lengths - the park was still completely flooded. I'm very grateful to the event team and volunteers for being so determined! This was to be the 100th run for Mrs, so I got her announced by the event director on the start line and she got a round of applause - congrats on your 100, sweetie! Me & Mrs before her 100th parkrun - black t-shirt time! The run was uneventful, and a bit slippery in places, and we ran across the line together to finish the pancake-flat 5km course in 28:54. This was pretty cool - a bicycle counter - wish I'd seen it yesterday! This was the wildcard of the day. Another 25 minutes in the car saw us arriving at Blairgowrie, a small town North of Perth. 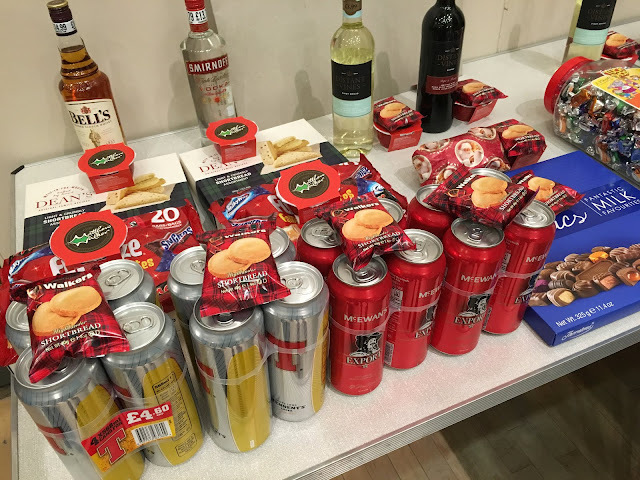 This was the 30th year of this event, and the 12th year there had been a walkers option too. It looked like the entire town had come out for the day, and most of it was crammed into their little town hall. 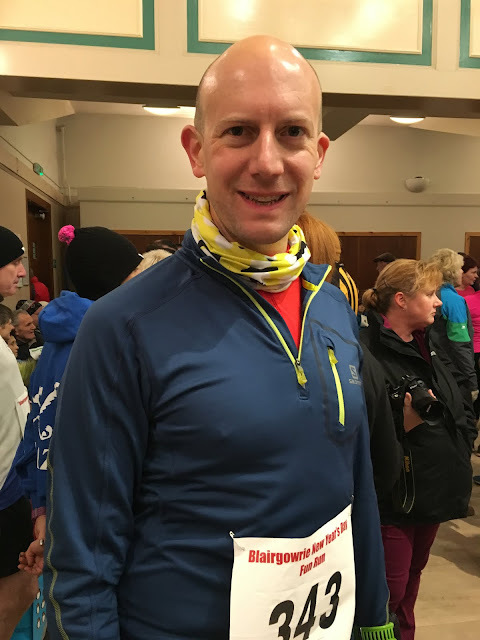 I registered and got my race number, and milled about waiting for the start. The walkers went off at 12:30, with the runners due to start at 13:00. 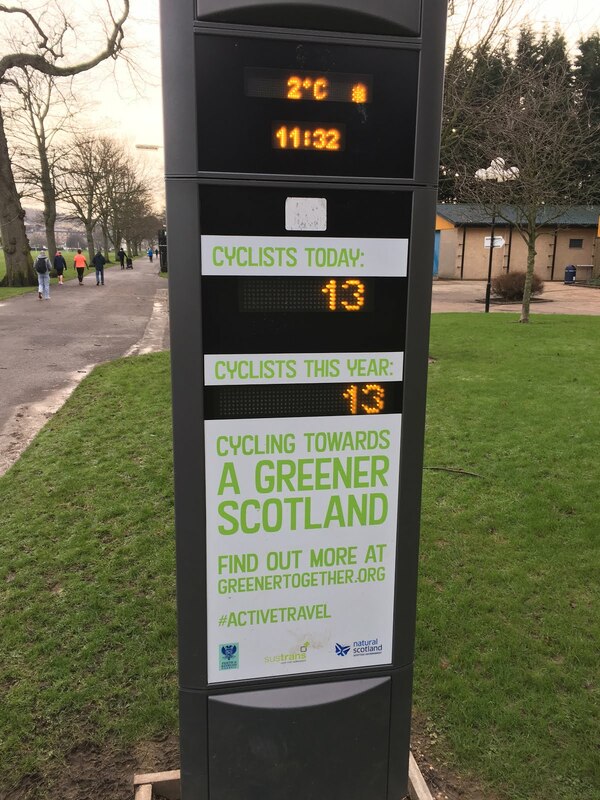 It was almost as if it was planned so that the park runners could get their from Perth and make it a triple-run day! There were certainly more than a few faces that we'd seen in both Dundee and Perth. Well over 100 walkers had set off at 12:30. and at least as many runners assembled for the start of the run. 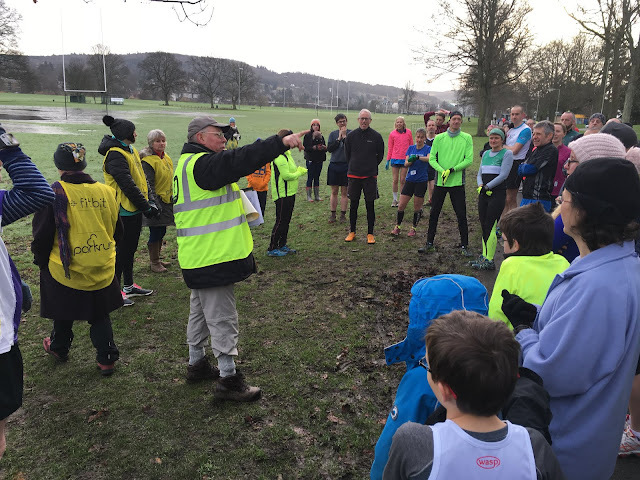 There was no parkrun "it's not a race it's a run" ethos here - this was going to be a race! I hadn't run hard for a while, and with 12.5km in my legs already from parkruns plus warmups I thought I'd go for it and see what happened. My legs took about a mile to warmup - two runs plus driving in between is not kind - and my feet were very aware that I'd changed from fairly padded grippy trail shoes to my lightweight and virtually grip-less road shoes. The prizes were very "local"
Warmed up I got, though, and I started reeling people in. 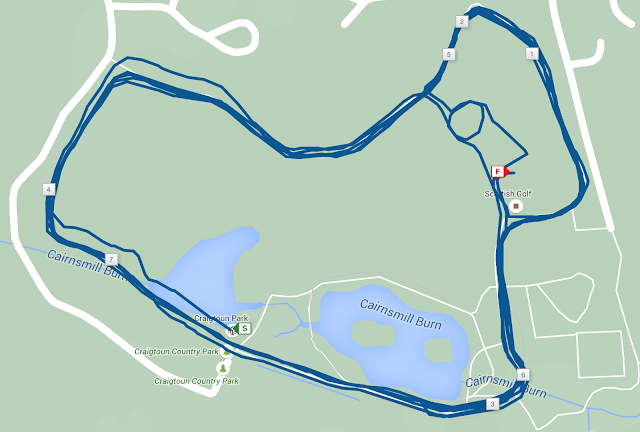 My pace steadily increased round the all-road circuit. It was roughly square in layout, and had a few gentle inclines to keep it interesting. I worked really hard in the last quarter to catch a couple more people, and managed to make every overtake stick - with the exception of a young girl who didn't take kindly to being overtaken in the last kilometre. She fought back and overtook me, before producing an amazing final few hundred metres and beating me by a good 15-20 seconds. I settled for a sprint finish with a gangly teenager who I just about beat on the line! I don't think there are any timings published as it's just a fun run, and there were no chips or people with clipboards, so I'm not sure what position I finished in - but according to my Garmin I ran the 6.15km in 29:02 - after a slowish start I'm quite happy with that! 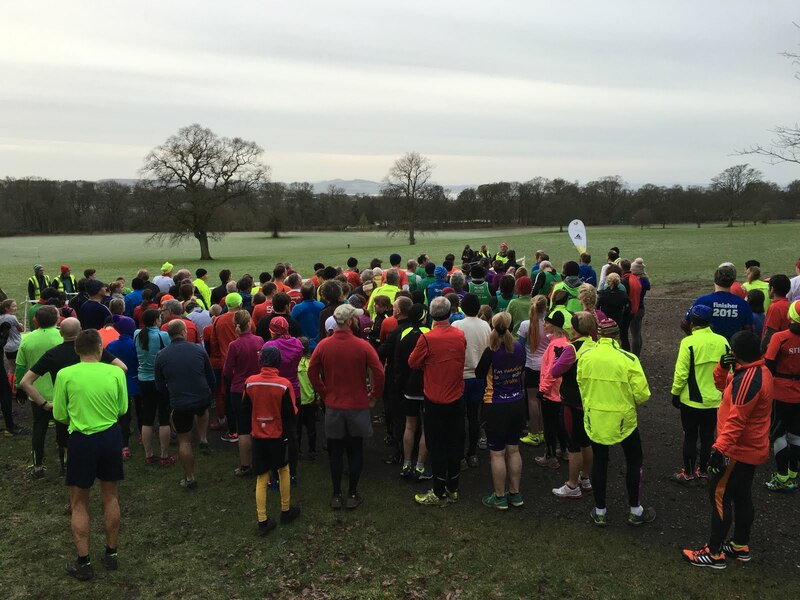 It was a cold blustery morning for the short drive out to Craigtoun Country Park for St Andrews parkrun. The park has ample parking, and there was once again a steady stream of parkrunners arriving. It was a good turn out - St Andrews had elected not to hold an extra New Year's Day event, so this was their first run of 2016. The route is on a shallow hillside, so half the circuit is up, and half down, with a flat straight-isa segment along the bottom. The laps are short, so we go round a little over three times with a wiggly bit added onto the end to make it up to 5km. I started slow, but soon decided to pick up the pace. I enjoyed reeling people in all the way round, and finished in an all-out sprint with a tiny child (parkrun is such a great leveller - where else can you get into a sprint finish with a 10-year old just as easily as with a 60-year old?). We accelerated more and more over the last 50m or so, and I let him just pip me to the finish line (there's no glory in actually beating a small child in a sprint finish in front of dozens of adult spectators :). Today's time showed I put a bit more effort in, and my official result had me at 24:40. 1) Nothing can be done without pipers piping. Nothing. At all. 2) People drive really quite incredibly slowly (we got stuck behind many cars driving at 40mph on fast national speed limit roads, and one in particularly who was barely managing 30mph!). 3) It's dark. Although I lived in Scotland for three years, that was a long time ago. I'd forgotten that in Winter it doesn't really bother with daylight - it's a cycle of night time, to dawn, to dusk, and back to night time! 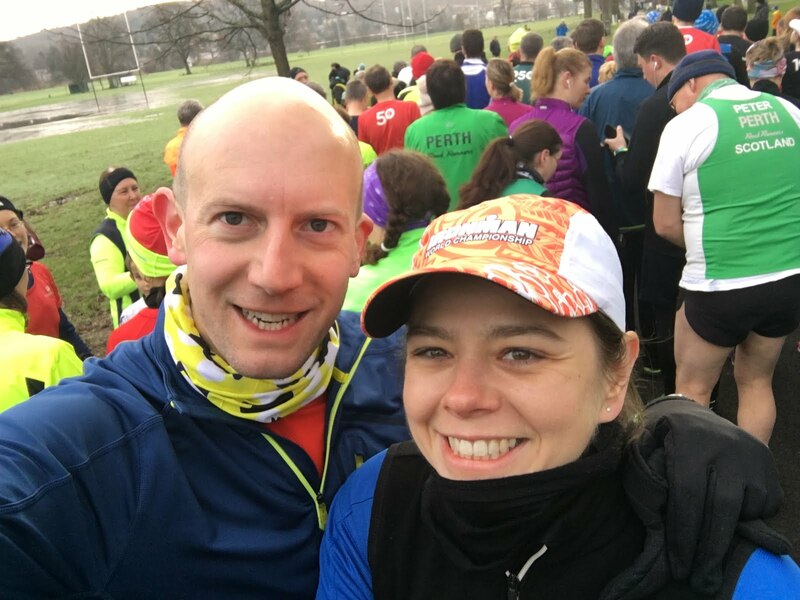 It was fun though, I enjoyed my New Year parkrun tourism with bonus local fun run. I wonder where we'll go next year?